Keeping your school playing fields and other landscaped grounds maintained to the high standards you expect requires regular work from an experienced and dedicated team of professionals. Many schools, colleges, care homes and other businesses have come to rely on Ricky Tyler Landscapes, knowing that we always deliver exactly the service required, and in a way that fully recognises the specific needs and care requirements of each customer. With more than a decade of proven results servicing more than 1,500 varied properties, we can deliver a weekly, fortnightly or monthly service tailored to meet the specific timing and procedural needs of any educational establishment. Our regularly trained and hugely experienced staff always work to the highest of standards. Where possible, we will use the same team each time, as they best know your requirements and our branded vehicles and uniformed staff allow you to always know exactly where we are working. Of course, each one is fully CRB checked and you can view our comprehensive Health and Safety, Public Liability and Employers Liability Insurance policies. We use strict quality control procedures and comprehensive spot-checks of our own work to ensure that the standards we both expect are always met. Our tools and equipment are replaced each year to prevent breakdowns and always deliver the best of results. Also, as an eco-friendly company, all garden waste is removed from your site as we work, and, as much as possible, this is then recycled and composted. Damaged or diseased turf can also quickly be replaced as and when required. Delivering the top quality grass and hedge cutting, line marking, playground maintenance, and other services that your school requires. Each project and location is unique, with its own specific requirements. 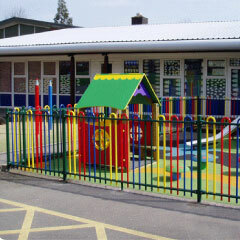 Here at Ricky Tyler Landscapes, you can trust our hard-won reputation, and know that we will work to create and deliver exactly the package of professional and unobtrusive services your school needs. To find out more during a free and no obligation initial consultation, and to discuss your specific needs, please call 01707 324 262 or 07986 224 09 now. Alternatively, you can contact us by using the contact form to the right and we'll call you back as soon as possible. 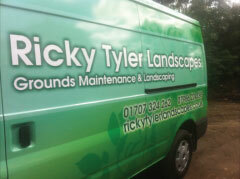 Ricky Tyler Landscapes can provide gardening and grounds maintenance services including School Grounds Maintenance covering London, Essex, Hertfordshire, Northampton, Buckinginghamshire & Bedfordshire .